As a secondary mathematics teacher, you know that students are different and learn differently. And yet, when students enter your classroom, you somehow must teach these unique individuals deep mathematics content using rigorous standards. The curriculum is vast and the stakes are high. Is differentiation really the answer? How can you make it work? Nationally recognized math differentiation expert Nanci Smith debunks the myths, revealing what differentiation is and isn’t. In this engaging book Smith reveals a practical approach to teaching for real learning differences. You’ll gain insights into an achievable, daily differentiation process for ALL students. Theory-lite and practice-heavy, this book shows how to maintain order and sanity while helping your students know, understand, and even enjoy doing mathematics. Classroom videos, teacher vignettes, ready-to-go lesson ideas and rich mathematics examples help you build a manageable framework of engaging, sense-making math. This book includes classroom videos, in-depth student work samples, student surveys, templates, before-and-after lesson demonstrations, examples of 5-day sequenced lessons, and a robust companion website with downloadables of all the tools in the books plus other resources for further planning. 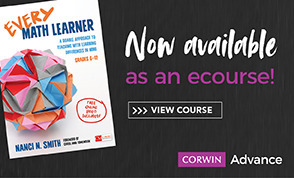 Every Math Learner, Grades 6-12 will help you know and understand your students as learners for daily differentiation that accelerates their mathematics comprehension.